“He’s here,” a voice whispered. Ethan Roam struggled to assess his surroundings, but his vision was blurry. All he could make out were a few trees around him. Only one thing was clear before him. The girl. She was the same girl he had seen many times before in his dreams. She was slender and meek with fiery red hair and kind blue eyes. Subtle freckles accented her nose and her lips were the color of cherry blossoms. She wore strange clothes. Each time, they were different, which Ethan wondered if that was normal for a recurring dream. They were crafted from organic materials he couldn’t quite pinpoint. Ethan’s heart pounded. He wanted to greet her or ask who she was talking about. This was his fifth time to have the same dream. Each time, she tried to talk to him, and he could never say anything in response. He sluggishly tried to get the words to flow past his lips. He strained forward to be closer to her, and for a split second, her eyes widened as if she’d finally seen a reaction from him. Ethan sat up with a start, realizing he’d fallen asleep during Dr. Wallace’s history class. The professor, annoyed at having been interrupted during one of his favorite lectures, balled his hands into fists and placed them firmly on his hips as he stared disapprovingly at Ethan. The rest of the class was quick to stare, too, only they were less annoyed and more amused, much to Ethan’s embarrassment. “So, yeah… Pretty sure I’m going to switch classes now. I can’t imagine going back there.” Ethan had finished recounting his literal and figurative nightmare to his good friend, Dr. Arthur Ellis. Arthur let out a jolly laugh at the idea of Ethan screaming during Dr. Wallace’s lecture. “I wish I could’ve seen the look on the old bulldog’s face.” He grinned, wiping a humored tear from his eye. Arthur was an old friend of Ethan’s mother, Karen, and Ethan had known him for most of his life. Arthur, a portly and generally jovial man, was around so much Ethan thought of him like an unofficial uncle of sorts. Being a professor seemed to fit him perfectly as he had a studious look to him and felt the need to educate others on all matters he deemed himself an expert at, which was nearly everything. Ethan found his positivity both admirable and enviable. Talking to Arthur always seemed to help calm his nerves and so he found himself opening up to him constantly when he usually blocked the rest of the world out. Recovering from the humor of the situation, Arthur scratched his graying beard as if asking it if he should pry. The beard seemed to concur, so he peered over his glasses and across his desk to where Ethan sat. Ethan sat up a little straighter as the tone of the conversation shifted. He glanced nervously at a dream catcher that was hanging near a bookcase cluttered with old tomes and artifacts. A feather appeared to flutter but then lay perfectly still against the wall. Although an English professor, Dr. Arthur Ellis specialized in folklore. It was his favorite topic in the world and would talk about it at length, given the opportunity. His office was decorated appropriately. That is to say, he’d immersed himself in items his guests would find interesting, thus giving himself the opportunity to engage in discourse on the subject. And if his guests did not ask questions, then he would gladly inform them about the carefully curated decor anyway. “The only dreams you ever have,” Arthur concurred. Ethan tried to explain. For years, the girl with the fiery red hair had appeared in his dreams and nightmares as what he believed to be a symbol for something, but now that she was talking to him…it was kind of creeping him out. “You know the girl isn’t new. And…she’s interacting more with me now. She’s not just there, you know? She’s a character in my dream rather than a figure in the background.” Ethan tried to explain. “It was the same one.” Ethan stared into his palms as he tried to recall details. “Large, black fur, saliva dripping from his mouth…but when he ran at me, he ran standing up.” He frowned as he remembered the disgusting appearance of the creature. Arthur seemed to listen with great interest, and when the last sentence rolled from Ethan’s lips, he leaned forward with a graceful and what appeared to be genuine curiosity only a well learned academic could pull off. “I’m talking to someone now,” Ethan quipped, but he knew what Arthur really meant. He’d been nudging Ethan to go to a doctor for years, but Ethan hated doctors. Especially, he hated the idea he might have some weird medical condition that would require him to go to a doctor. “Someone more qualified than myself.” Arthur smiled patiently. Arthur seemed to criticize him over his glasses with an impatient stare. “I don’t like people,” Ethan retorted stubbornly, knowing he was losing the argument. “Who does?” He pulled a card out of his wallet and handed it to Ethan. Maybe Arthur was right. If his sleep problems were finally getting in the way of his daily activities, then maybe it was time to be proactive about them. “Aren’t all your friends, like your collectibles, unique?” Ethan teased, as he slipped the card into his pocket. 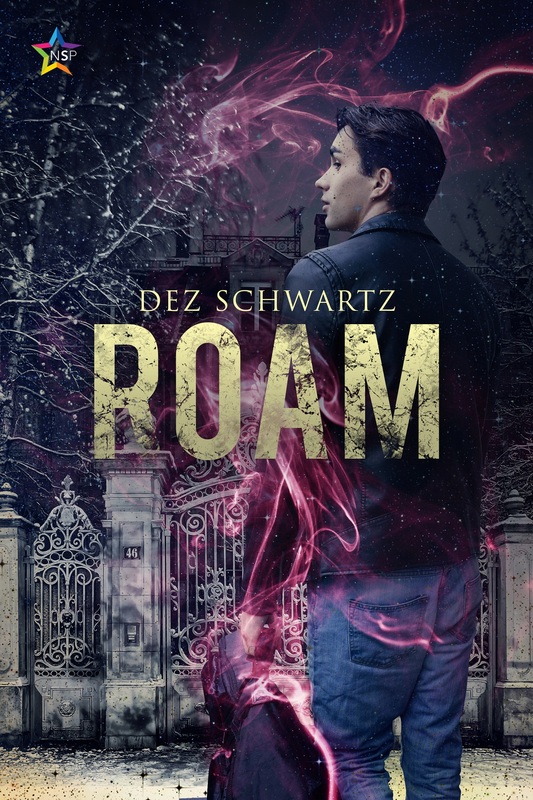 Dez Schwartz writes mostly LGBTQ Paranormal and Gothic Historical Fiction about dapper occultists, scheming supernaturals, and ghost hunters. She currently resides in a haunted Edwardian era home in Texas and enjoys coffee, art, and Oscar Wilde.